Middletown Honda is hosting the Pre-Memorial Honda Savings Event. 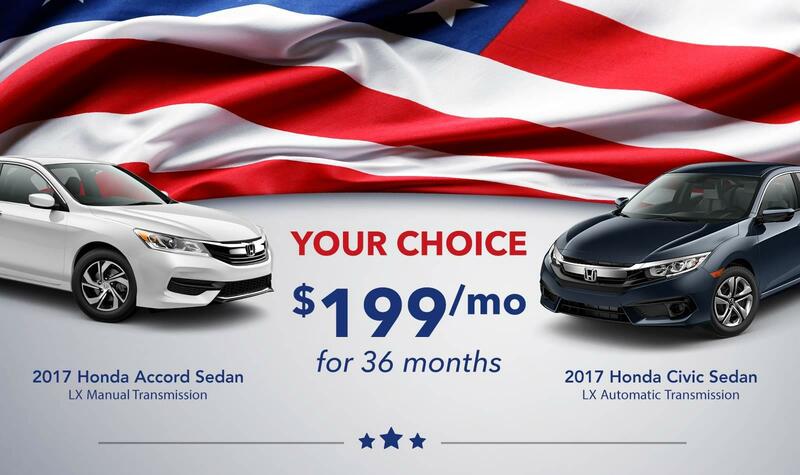 You can choose to lease either the 2017 Honda Civic Sedan or the 2017 Honda Accord Sedan for ONLY $199 per month! * This offer ends May 24th so hurry in today! Give us a call at (845) 343-0055 or find us at 520 NY-211, Middletown, NY 10941. We are a hassle-free dealership with friendly, professional, and no-pressure sales people who truly care about the experience you have with us. We carry expertise and experience, and are always here even if you just have questions! We have been voted one of the best places to buy your new or used vehicle year after year, as well as one of the best places to get your car serviced! You’ll find what you need at Middletown Honda. *Customer must choose between 2017 Honda Civic Sedan LX Automatic Transmission or 2017 Honda Accord Sedan LX Manual Transmission. Lease is $199/month for 36 months. No security deposit required. See dealer for complete details. offer expires 5/24/17.